I am admiring the cluster of blooms. Very lovely! 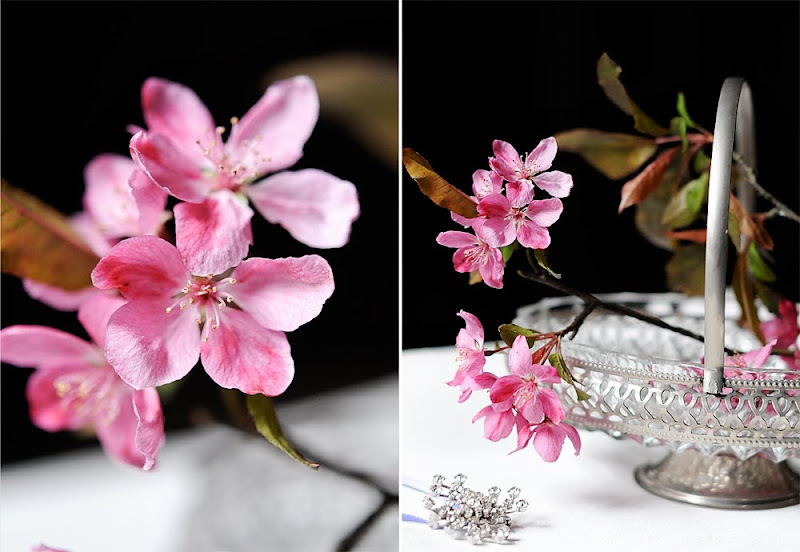 It looks as if your long winter is over ... your crab apple blossoms are captured so beautifully in your photography. Sit back, rest your hand, and enjoy the spring show! I am in awe of how beautiful the Crabapple trees are and love that you added the whimsical pin as decoration. That is so beautiful! Thanks for hosting! Beautiful pictures. You always have the most beautiful mosaics! I am so glad that your hand is feeling better. Hope it continues to feel better. The jewel tones of that crabapple juxtaposed with the pretty broach...wowzer! It is amazingly beautiful. If you could hear us, you'd hear echoes of your sweet mother-in-law's delight. Keep resting until your hand is feeling 100%. No sense in pushing these things. Have a wonderful week, Mary. Thanks for all you do to make Mosaic Monday possible! Stunning photos...thank you for sharing that lovely moment of joy with us...Hope your hand is doing much better soon. You know what else it is? We've had a chilly spring - and they've kept their flowers longer. At least, that's what I believe. The spring bulbs lasted longer, as well. Good to see you again. I have much catching up to do. Mary, your photos are beautiful and I can see why they would bring your mother-in-law so much joy. Dementia can be such a difficult path for all involved, I'm glad that she could appreciate the beauty of Spring with her family. You are very disciplined to allow yourself recovery for your hand, not blogging....this too can be difficult, especially when you really have something that you want to share. The crab apples blossoms must smell so delightful! I'm glad to hear that your hand is feeling better...contine to let it heal. So happy about your other blog being included in Artful Blogging! Just beautiful Mary. Sorry to hear you are having problems with your hand. Hope all is well soon. I'm so sorry to hear about your hand. I know how my hand aches after spending too much time at the computer. Sometimes we need to step away. Lovely photos and your mother-in-law must have enjoyed seeing them so much. 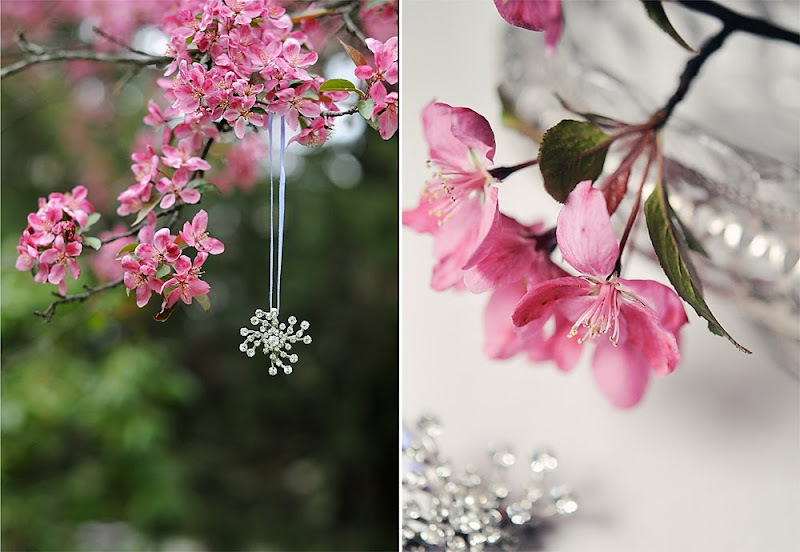 Pink and silver look lovely together and the pink blossoms are dazzling by themselves. Each blossom a lovely spring work of art. And you so masterfully show their natural beauty off! I'm so happy to hear that about your mom. Beautiful crabapples. I'm going to the bookstore tomorrow! beautiful blossom! so glad I found you! just added my link, looking forward to discovering more mosaics too! Beautiful I would love to participate next time! Beautiful crabapple, still waiting for mine. But definitely getting there! LOVELY photographs Mary! Wish you a great week ahead! Oh Mary, such lovely photographs. Crabapple blossoms in all their glory. And the sparkly pin adds just the right amount of bling. I hope your hand feels better soon. Take time to let it heal. Have a wonderful week. How gorgeous! Love all Mary! Your photographs are wonderful as ever. This Spring our flowers and blossoms have been marvellous too over the pond, as you can see on my blog!! How lovely the joy your MIL found in the blossom as do we all. Congratulations on the magazine inclusion. Hope your hand is better soon as I miss all your blogging and photographs!! Thank you for these wonderful photo's, the charm of our day! Oh Mary, I don't know what is more beautiful, those magnificent crabapple Blossoms or your heartwarming story! I sure miss Crabapples, we used to eat them as children 'til our tummies hurt! *smiles* Alas, apple trees don't thrive in a Desert and because we get little or no frost they would never bear a Harvest, so it has been many decades since I have enjoyed the scent, sight and tastes of what the Crabapple Tree produces. Thankyou for the lovely photos to remind me... what a beautiful Mosaic they have made! Indeed all things beautiful... specially in Pink! Lovely shots and hope your mil gets better soon. Beautiful and heart warming post. It is has been a spectacular spring for blossom here in Italy as well this year. Your pictures of the crabapple blossoms are exquisite. We're having a beautiful spring here as well. Gorgeous flowers, and just glorious to see on a gloomy Monday morning for me! It has been an exceptional spring in our part of the country as well -- in good and bad ways. I've seen things bloom here that I've never seen before and the blooms seem more abundant and bright that ever before. Wow, you outdid yourself this time! Thanks for hosting! Gorgeous, gorgeous, gorgeous, Mary! And to mix in the sparkly silver and jewels.... just amazing! So glad you are getting some beautiful flowers now! Such a fantastic sight. Your crabapple-photos are marvelous. Apple blossom just says May to me. Your shots are simply gorgeous, Mary. I just came over from Bohemian Valhalla. 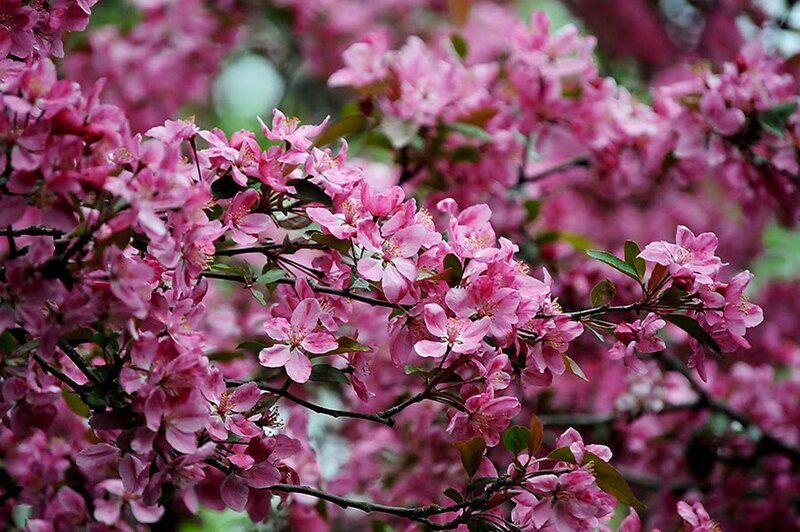 Those are amazing shots of the crabapple blossoms!! I am loving Mosaic Monday! My Mom in Connecticut mentioned the same thing you did about the flowering trees. Her magnolias were so full of blossoms this year. She said she does not remember it being so full! We both thought it must be ALL the snow that you all had this winter. In fact, she even noticed her bulb flowers were coming up and blooming like never before also. Hope your hand is soon feeling much better! Oh, SOOooooo beautiful, Mary! I'm glad that your hand is feeling a bit better. Rest up! =] Spring came to VT, this week and I feel like myself again! It's hard to resist spending all day outside - especially with the camera. Yes, I have been cutting branches for the house, Hope the Lilacs are good this year, love to drive with the windows open, Camden Maine smells of Lilac. My crab apple is just starting to burst and I really hope it remains cool because I think that is why they last so long...Your mosaic is breath taking!! what gorgeous blooms - I have never seen them, so thankyou for sharing.